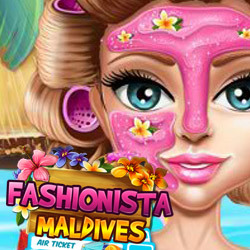 Description: On an exotic island every day is perfect for beach but before going out our shopaholic needs a complete makeover! Get rid of all those breakouts, use the beauty treatments to relax and combine sparkly shades of makeup for that extra pop of color. Choose a girlish hairdo, a floral outfit and a beautiful pair of sunglasses for a chic look. The three completely different beauty sessions will make you glamorous and ready for a fun day at the beach!